Time to Replace Your Chris-Craft Boat Canvas? Chris-Craft has carved out a place in history with their attention to detail and a dedication to craftsmanship. The accents such as handcrafted teak, stainless steel burgee holders and trumpet horns define their attention to detail and dedication to craftsmanship. The Ameritex engineering team has worked closely with Chris-Craft to develop and design the best fitting and functioning boat tops and enclosures from the highest quality materials. Choosing Ameritex to provide replacement canvas identical to the original canvas is the best choice you can make. We will remake the exact Chris-Craft canvas parts at our state-of-the-art facility and deliver them ready for installation. A Chris-Craft vessel is an investment you take great pride in. 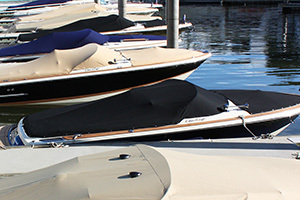 Ameritex is proud to provide the original canvas for Chris-Craft boats and help protect your investment for years to come by re-manufacturing replacement canvas forÂ your boat. Find out just how easy it is to restore the worn out canvas on your Chris-Craft to brand new by submitting a no-obligation quote request now.